PC-Plumbing™ Epoxy Putty is for pipes. 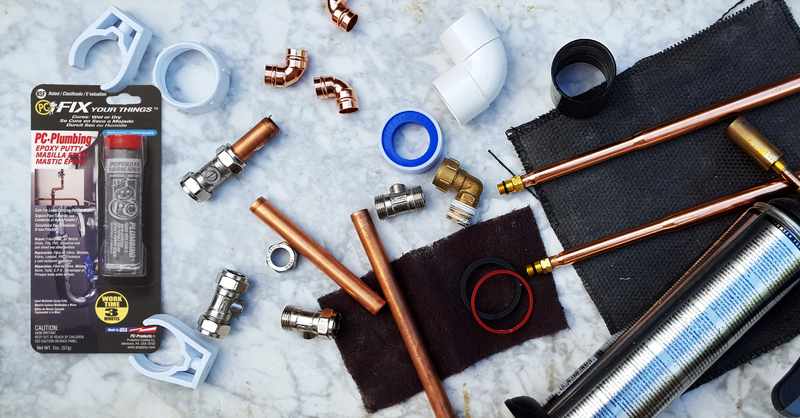 Use PC-Plumbing™ to stop leaks in less than 60 minutes. Pre-measured and easy to use and 2 part epoxy putty does not require tools. Hand mix and apply. NSF® approved for plumbing repairs and for contact with potable water supply pipes. Fibreglass, all metals, PVC, glass, tile, ceramics and more. Can PC-Plumbing™ be mixed in small portions? Can it be mixed in large portions? PC-Plumbing™ can be mixed in small portions and will stick to cured PC-Plumbing™. Larger mixes are not practical because of the short work time. Is PC-Plumbing™ suitable for repair to PVC pipe? ABS? 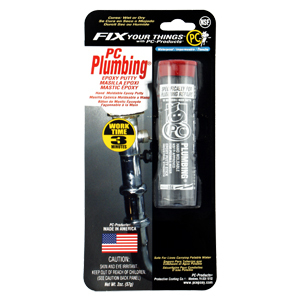 PC-Plumbing™ sticks to rigid PVC and ABS pipe. How long should PC-Plumbing™ be mixed? Mix PC-Plumbing™ for 45 to 60 seconds. Will PC-Plumbing™ stick to an aluminum pot and is it safe for food contact? PC-Plumbing™ is not approved for food contact. Although epoxies are relatively low-toxic, they are very limited for applications that involve food. The water is turned off and there is a small drip. If PC-Plumbing™ works in wet conditions then why isn’t it stopping the leak? 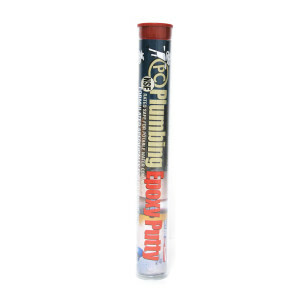 After PC-Plumbing™ is mixed and applied it is soft and pliable. The drip is a small volume of water but has enough pressure to push the PC-Plumbing™ out of the way before it hardened. Even a drip caused by standing water can have enough pressure to cause leakage before it cures. PC-Plumbing™ does work in wet conditions but dry conditions are preferred.